Good lead is an art form that requires sensitivity. A good leader is sensitive to the partner's level of dance. As a leader you must make your intentions clear by committing to the movement and following through to the end. There is no room for mixed messages, which my be confusing to the follower and lead to awkward moments. A clear understanding of the movement is necessary so that it can be communicated easily and on time to the follower. 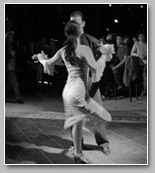 In all forms of dance, rhythm is 'key' whether it is Salsa, Cha Cha or Merengue. Rhythm distinguishes the dances and gives them their unique personalities. Staying 'on the beat' or on rhythm allows for better partnering and the ability to progress to more interesting and intricate movements. In essence, keeping good rhythm is 'key' without it dancing becomes laboured and a chore especially for the person following. Dancing will then become a wrestling match, pushing and pulling each other around the dance floor. TEAMWORK gets the most points. YOU are judged by how good you make your partner look. Copyright Dancing Thru Life - Burlington Salsa Dance. All rights reserved.